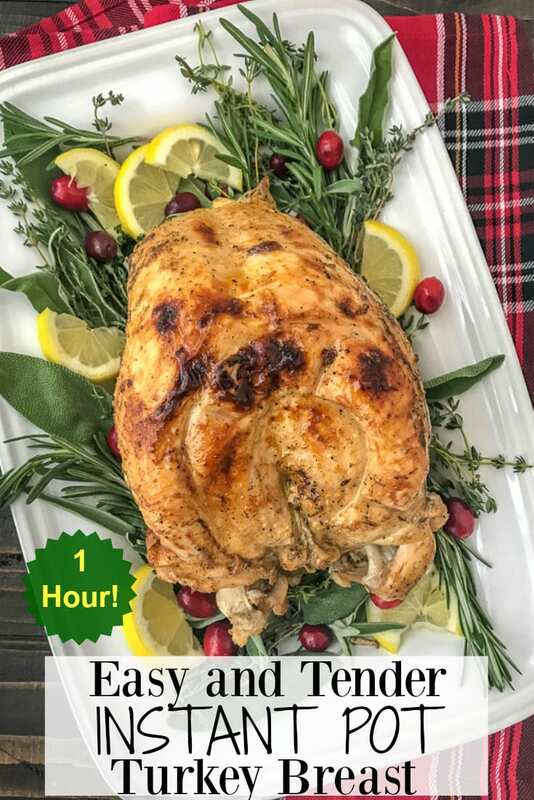 Easy, Tender Instant Pot Turkey Breast – If you’re looking to cut back on the time and hassle of preparing a delicious and tender turkey breast this holiday season – then look no further! No getting up at the crack of dawn. No need to baste every 20-30 minutes. Take the guesswork, as well as all the extra time, out of your already busy holiday preparations! 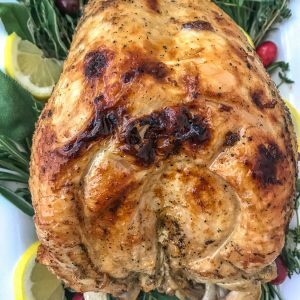 This turkey is fall-off-the-bone tender and moist and takes under an hour to make! Including the gravy. Say goodbye to those early mornings getting up at the crack of dawn to prepare a turkey for your friends and family. No more basting the turkey every 20 to 30 minutes either. Spend that time preparing the rest of your meal and not stressing, while letting the Instant Pot do all the work! Worried that cooking it in the Instant Pot won’t give you a tender, juicy turkey breast? Think again! The meat cooks seasoned and on top of the chicken broth, coming out super tender and flavorful. To get that crispy browned skin, I simply brushed it with butter and popped it under the broiler for a few minutes. That’s it! Everything took approximately 1 hour and 15 minutes – from start to finish (with the broiler step). This recipe calls for a 6.5 pound turkey breast that can feed anywhere between 4-6 people. I have a 6 Qt Instant Pot that can accommodate up to a 7 pound turkey or so. If you have a 6 quart pot, I would not advise going over that. If you have an 8 quart Instant Pot, I would recommend up to a 9-9.5 pound turkey breast. Full recipe with directions can be found on the recipe card below! Remove the (thawed) turkey breast from it’s wrapping, rinse and dry it with a few paper towels. Add the chicken broth to the bottom of the Instant Pot. Place the trivet on top of the broth. Butter and season the entire turkey, making sure to rub the butter and seasonings all over. Stuff the inside of the turkey with chopped onion, celery, garlic cloves, and a few sprigs of thyme. Place the turkey breast into the pot with the neck (stuffed end) facing up as shown in the photo above. Close the lid and the steam valve. Set on High Pressure for 6 minutes per pound. I had a 6 1/2 pound turkey breast, so I set my time to 39 minutes (6 mins x 6 pounds = 36 minutes + 3 minutes for 1/2 pound = 39 minutes). Do a natural release for 10 minutes, followed by a quick release. All that’s left is placing it under the broiler and making the gravy! 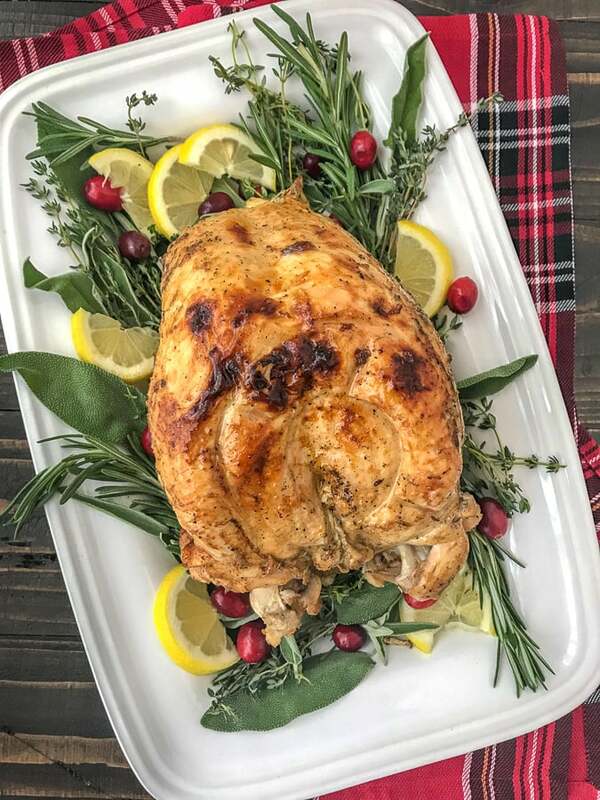 If you don’t have an Instant Pot, you can easily bake it like a traditional turkey breast. It will just take longer and may require the typical basting every 20-30 minutes to keep it tender and juicy. Preheat oven to 325 degrees F. Pour 1 cup of chicken broth to fully cover the bottom of your roasting pan (a pan that is just large enough to hold the turkey). Add the chopped onion, celery, and garlic cloves to the bottom of the pan, scattered. Butter and season the entire turkey, making sure to rub the butter and seasonings all over. Set the meat breast-side up in the roasting pan. 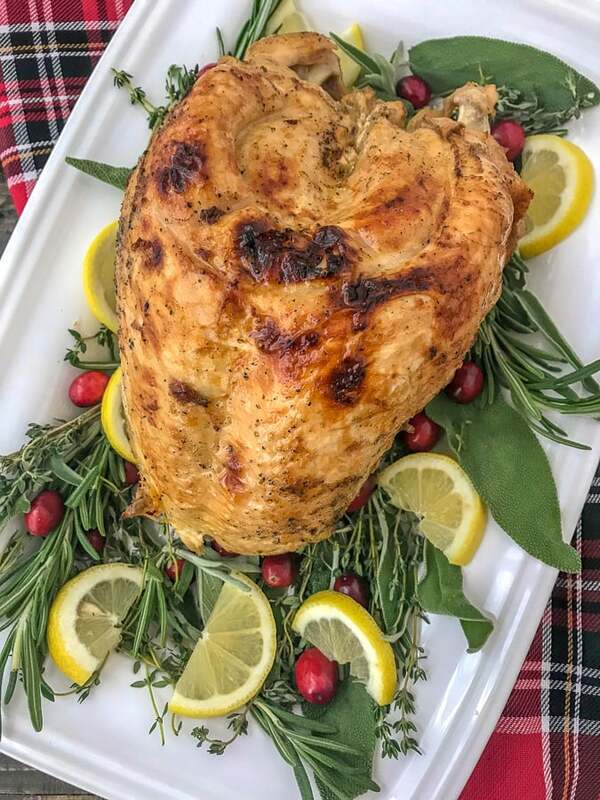 Roast (basting every 20-30 minutes) for 2-2 1/2 hours or until an instant read thermometer inserted into the thickest part of the breast reads 160-165 degrees F.
Remove from pan to a cutting board, cover with a tent of foil and allow the turkey to rest for 15 minutes or so. The turkey will continue to cook while it is still hot. This will also allow the juices to settle, keeping the flavor locked in when its time to slice. Gravy: You can skim/filter the broth of the cooked vegetables and fat/drippings and then transfer it to a pan over medium-high heat. Add the cornstarch/water mixture the the broth starts to simmer. Whisk until thickened, approximately 3 minutes. Carve the breast and serve with gravy. Instant Pot DUO60 6 Qt 7-in-1 Multi-Use Programmable Pressure Cooker, Slow Cooker, Rice Cooker, Steamer, Sauté, Yogurt Maker and Warmer – I have had this Instant Pot for quite some time and I have zero regrets buying it. It works perfectly for my husband and I to have a main meal, with leftovers for lunch or for meal prepping, as it is supposed to feed a family of 4-6 people. Harbor Instant Read Thermometer – I use this with liquids and meats to check that the temperature has reached the approximate and/or safe temperature needed. I recommend checking that the turkey breast has reached the recommended, safe temperature: 165 degrees F in the breast and 175 degrees F in the thigh, prior to removing from the Instant Pot. Hot Pot Fat Skimmer – This works wonderfully for skimming the fat from the chicken broth that cooked off of the turkey so that you can make the gravy. If you haven’t checked out my latest Friendsgiving Day Spread, then what are you waiting for? I created this spread for several of my friends this past week, as an early holiday get together, and it was a hit! I tried to keep everything on the lighter side of things (as much as I could), as we all have one too many functions to attend this year! Am I right? So if you’re looking to host your own Friendsgiving this year or even keep your Thanksgiving on a lighter note, then check out my Friendsgiving Day Spread post! Creamy Mashed Sweet Potatoes – boiled, rather than baked, with a subtle brown sugar, cinnamon flavoring. Comes together in approximately 20 minutes! Simple Traditional Herb Stuffing – very easy to make, comes together in minutes while the oven does all the hard work. Lightened up a bit, but still packed full of flavor! Garlic Parmesan Skillet Rolls – soft, fluffy and warm perfection fresh out of the oven! All made from scratch and baked until golden brown with the most divine garlic-herb butter and parmesan topping! Maple Roasted Carrots – baked until fork-tender with a subtly sweet taste. The best lighter side option when it comes to a vegetable side dish. Garlic Parmesan Mashed Cauliflower – rather than the traditional mashed potatoes, I went with a lighter option – cauliflower! Cooked cauliflower is pureed with a delicious blend of ingredients until it reaches that creamy, fluffy texture. Promise you won’t be able to tell the difference (too much!). Pumpkin Cinnamon Rolls with Cream Cheese Frosting – of course there always has to be a decadent, rather sinful pumpkin dessert! Otherwise it’s not a Thanksgiving (or Friendsgiving) Day feast, right?? 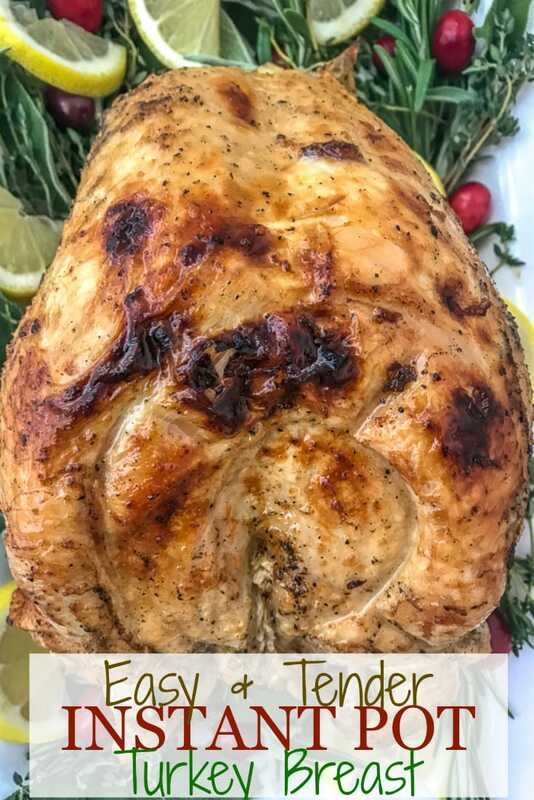 Easy, tender Instant Pot turkey breast that takes all the effort, time and guesswork out of creating a healthy turkey breast! All done in the Instant Pot in under an hour. Add the chicken broth (or vegetable broth) to the bottom of the pot. Put a trivet into the pot overtop of the broth. Remove the (thawed) turkey from its wrapper and pat dry. Remove any items from the inside of the cavity and rinse the turkey thoroughly. Pat dry with paper towels. To a small mixing bowl, combine: melted butter, garlic powder, onion powder, rosemary, sage, thyme, lemon juice, salt and pepper. Mix to thoroughly blend. Brush this mixture over the entire turkey breast, rubbing it in with your hands. Stuff the turkey breast with the celery, onion, garlic cloves, and fresh sprigs of thyme. Place the turkey breast into the pot, onto the trivet, with the neck facing upward (the stuffed end). Place the lid on the pot and close. Set the valve to the sealed position. Set the Instant Pot to High Pressure for 6 minutes per pound. So for a 6.5 pound turkey breast, set it to 39 minutes. It will take 15-20 minutes to come to pressure before it starts to cook, so now is the time to prep another dish, if you have one. When the timer goes off, do a natural release for 10 minutes, followed by a quick release to remove any remaining pressure. Carefully remove the turkey from the pot to a serving dish (or roasting pan if placing under the broiler), and cover with foil to keep warm. Cancel the Instant Pot action and turn it to 'Sauté'. In a small mixing bowl, combine the cornstarch with the water. Whisk to thoroughly combine. Using a skimmer (listed in the 'Tools Used' section above), skim any excess fat from the broth. Slowly pour the cornstarch mixture into the pot of broth and whisk until the broth starts to thicken. IF BROILING TURKEY: Place the turkey into an oven safe baking dish or pan. 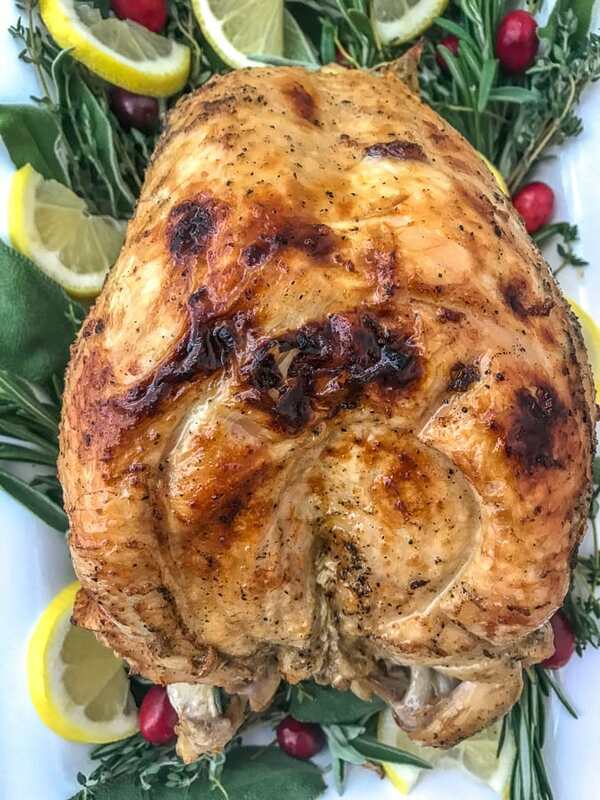 Brush the melted butter over the skin of the turkey and place under the broiler set on LOW for 3-4 minutes, or until the skin starts to brown. Keep an eye on the turkey! Remove and serve with gravy and sides of choice. Check my post for some recommendations! NUTRITION: This recipe serves 4-6 people. Nutrition is based on 1 serving of 6, including the gravy. 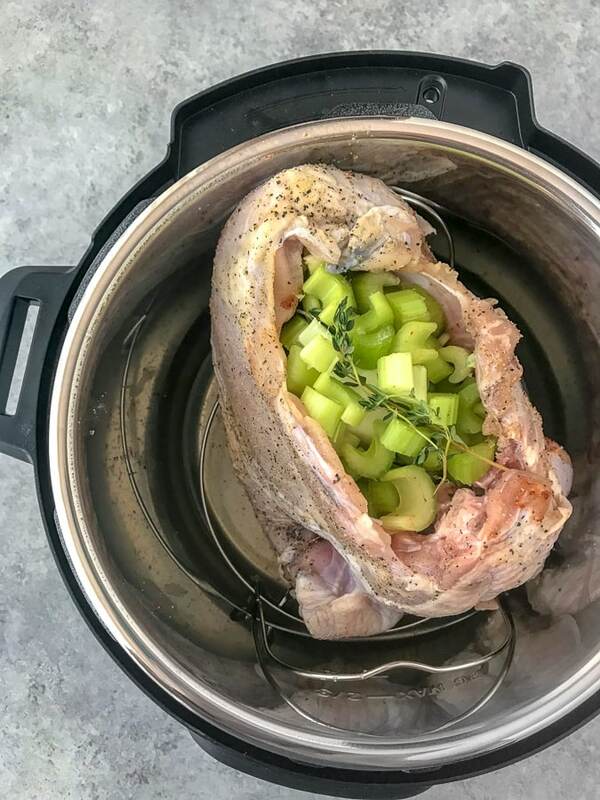 TURKEY INSIDES: You can discard the celery, onion, garlic and thyme from the inside of the turkey. They are merely there for providing moisture, as well as additional flavor, to the turkey while it cooks. SODIUM: If you're watching your sodium or prefer to control how much sodium goes into your dish, I recommend using a low-sodium or no-salt-added broth and adding salt to suit your taste preferences. i almost didnt keeP my INSTANT pot. Thanks to your turkey breast recipe, i just might keep it on the counter within easy reach. Thank You so much for sharing it with me!